One of the most enjoyable things about getting together with other gardeners is to share experiences of the season. 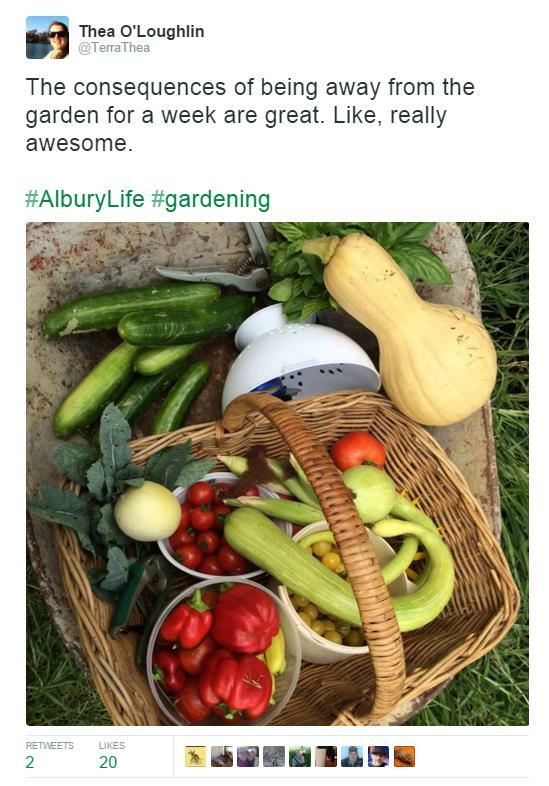 It might be to brag about a great harvest or other ‘wins’. But we can also learn from each other by sharing the challenges – and possibly avoid a problem that others have had, or commiserate when we’re all in the same boat. We thought it might be fun to share some of these conversations online, as well as at our gatherings. 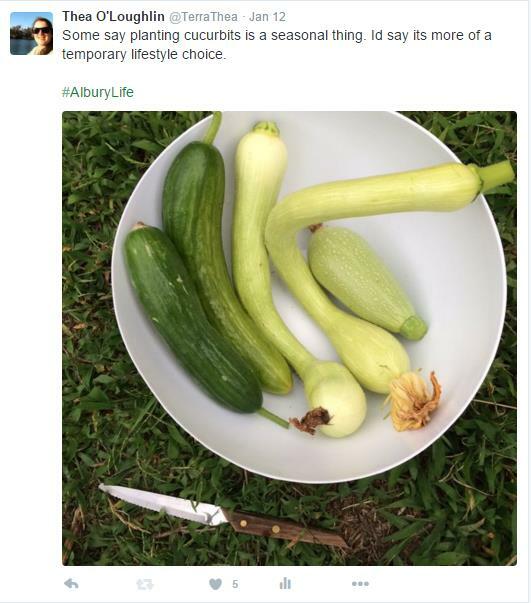 After admiring Thea and Luke’s posts about their garden adventures on social media, we asked Thea if she’d write something for our inaugural round of How does your garden grow? And she did! Here’s another response to our prompt How does your garden grow? I have had a challenging year and probably have the least productive veggie garden since we moved to Wooragee more than 20 years ago. I did get a bit depressed – we have planted so well for habitat that the parrots and the wallabies have demolished much. But I did “put it on the table” and have a look and realised that I was away in September when I usually get ready for summer garden and then of course when I got back had to catch up on all other things I’d missed, then worked until 23rd Dec instead of stopping earlier, and had a busy family end of year. But there are some positives too – I might just get my autumn veggies in on time, it gave me a chance to really build up the gardens and do some other things like play with our 2 gorgeous new miniature pigs that we collected on 23rd December. Small but distinctive … and with a huge potential to wreak havoc in the garden. It’s a fruit fly. Thanks to those who made it along to our first gathering for 2015 in February. We had an enjoyable evening chatting about summer seed collecting, and many attendees took the opportunity to deposit or take home some seed from our seed bank. 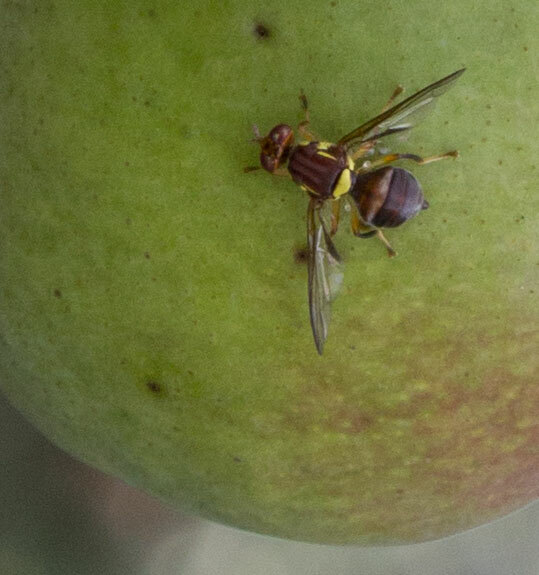 Our discussions as to members’ observations of the recent season in the garden were dominated by comments, questions and reflections on fruit fly (yes again, or is that still?!). There is a fierce war currently raging at our home in Allans Flat. It’s us against the birds, and we are fighting literally for the fruits of war.